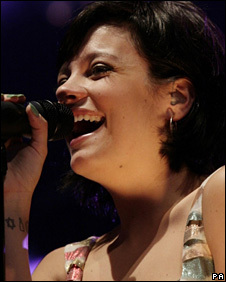 British pop star Lily Allen has been lined up to guest star in long-running Australian soap Neighbours, the show has confirmed. According to the soap's website the 24-year-old "wasted no time in accepting the offer". Allen will film her role next month while touring in Australia. She will appear alongside Matt Werkmeister, who plays Zeke Kinski. "I'll be star-struck for sure but will try my hardest to stay professional," said Werkmeister. Set in the fictional suburb of Erinsborough, Neighbours focuses on the residents of Ramsay Street - who over the years have included singer Kylie Minogue and Gladiator star Russell Crowe. In 2007, comedians David Walliams and Matt Lucas made a cameo appearance on the show, which is now in its 24th year. The pair appeared as Little Britain characters Lou and Andy in the background of a scene in the pub.